Torontoist has been saying for years that City Council provides better bang for your buck than any other piece of live entertainment in this city. At absolutely no cost (unless you count, you know, taxes), you can attend this extravaganza that combines the spectacle and epic scale of a mega-musical with the manic energy of a really good Fringe show. Each run lasts two consecutive days a month but is often held over to a third day due to popular demand (i.e. Council’s inability to get through the items on its agenda). Check out the schedule here. The show begins at 9:30 every morning and can run almost twelve hours, including intermissions from 12:30-2:00 and 6:30-7:00. As is the case with many pieces of performance art, you can wander in at any time, stay for as long as you like, and then leave when you get bored. And you don’t even need a handstamp or ticket stub to re-enter! Finding the theatre can be a bit tricky, though. Once you wander into City Hall, go straight ahead into the rotunda and then veer either left or right until you happen upon elevators. Press “C” or “3C” (depending on the elevator), and up you go to Mount Olympus. Just keep in mind that food and drink (even bottled water) and signs and banners are prohibited in the auditorium. Also be sure to pick up a programme (or “order paper,” as they call it) on your way into the chambers; there’ll be a stack of them, printed on brightly-coloured paper, sitting on a table to your right as you enter, and they’re enormously helpful for following the action. But if making it down to 100 Queen West is too much of a hassle, there are still ways for you to enjoy the proceedings from the comfort of your very own home or workplace! Rogers Television (cable channel 10 in most of Toronto, 63 in Scarborough) broadcasts the first two days of every City Council session, although it cuts off at 6:00 or 6:30 each night. 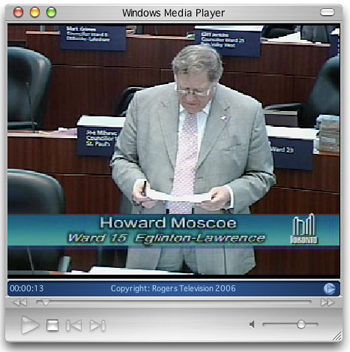 If you have Windows Media Player, you can watch the same feed on your computer [WMP file]; the online broadcast, however, remains live as long as Council is sitting (today it continues through “sundown” at 9:02 p.m.). While this is extremely convenient, and we even know a City Hall reporter who watches Council from home rather than trekking down, it’s no substitute for going in person. Whenever Rob Ford rises to speak, for example, everyone else on Council (regardless of political ideology) groans. As he speaks, the rest of Council smirks and makes remarks to each other. McConnell repeatedly thrusts her head into her hands, silently pleading for him to shut up. It’s quite an event, and you’ll never see it if you only watch via Rogers. Observing from home has the advantage, however, of letting you follow along with the script as the action plays out (kinda like the special feature on the Taxi Driver DVD). Click on “Order Paper” in the upper-right corner of the first page of the agenda to find out what’s on for that session of Council, and then go back to the agenda to find the links to the actual texts of the motions and staff reports being debated. It takes a little while to get the hang of it, but eventually you’ll be able to shout at the screen more intelligent and better-informed opinions than those espoused by the $95,000-per-year councillors. And you’ll be that much more ready for the next round of auditions. Jonathan Goldsbie is a campaigner with the Toronto Public Space Committee and spends more time at City Hall than is healthy. Panorama by photopia / HiMY SYeD. Screencap of the online feed by Goldsbie.